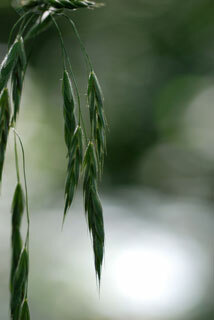 Also Called: Canada brome, hairy woodchess. Culms: Solitary or few together, erect or ascending, stout, hollow, glabrous to sparsely soft-hairy; nodes pubescent. Blades: Flat, 6 to 14 inches long, 1/5 to 3/5 inch wide, 4 to 10 per stem; upper surface soft-hairy; lower surface dull, smooth or rough; base narrowed. Sheaths: Mostly shorter than internodes, loosely overlapping, sparsely to densely soft-hairy, less commonly glabrous. Ligules: Membranous, 1/25 to 1/12 inch long, jagged; auricles absent. Inflorescences: Panicle, open, loose, nodding, 4 to 10 inches long; branches elongate, loosely spreading, often zig-zag, drooping. Spikelets: Numerous, drooping, 4-11-flowered, 2/3 to 1.2 inch long (excluding awn), 1/3 to 2/5 inch wide, slightly compressed; stalks 1/3 to 4/5 inch long, longer than spikelets; glumes and lemmas uniformly densely pubescent; glumes narrowly elliptic-lanceolate; first glume 1/5 to 1/3 inch long, 1-nerved, tip pointed; second glume 1/5 to 2/5 inch long, 3-5-nerved, tip pointed with short awn; lemmas elliptic, 1/3 to 1/2 inch long, conspicuously veined; awn straight, 1/6 to 1/3 inch long. Habitat: Moist woodlands, stream banks, roadsides, sheltered ravines.